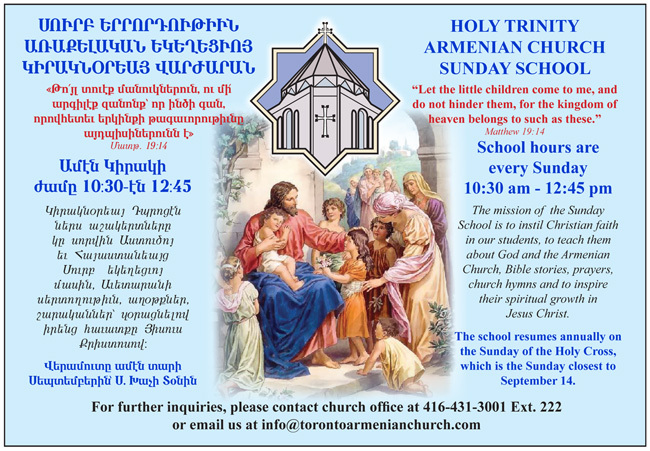 The Sunday School at the HolyTrinity Armenian Apostolic Church in Toronto, Ontario, Canada has been in existence since 1955. The primary mission of the school is to instill Christian faith, inspire spiritual growth, and train the child in moral values and sound character. The educational component complements the child’s daily schooling. Christian Armenian heritage and church history form an integral part of the school’s curriculum and overall activities. We gladly acknowledge that Armenian parents have always understood the importance of their children’s Christian education. We encourage all parents to take advantage of this unique opportunity by guiding their children’s footsteps to church and enlisting them in the school. The church and the school go hand in hand to provide a healthy atmosphere for the child to grow in reverence towards God Almighty and our Lord and Saviour Jesus Christ; to develop a keen sense of belonging to the Holy Mother Church; and to get acquainted with Armenian peers, many of whom will become their lifelong friends; and develop to become productive citizens with a strong foundation in their Armenian heritage and identity. All children of ages 3-14 are welcome to attend the Sunday School. The school registration has always remained free of charge. The school welcomes with open arms all Armenian children regardless of whether they are familiar with the Armenian language or not. A group of dedicated volunteer teachers carry on the school’s sacred mission. Please do not miss this opportunity for your children’s Christian Armenian education. The school resumes annually on the Sunday of the Holy Cross, which is the Sunday closest to September 14. The school registration starts a week prior to that at the church, and continues throughout the academic year. For further inquiries, please contact church office at 416-431-3001 Ext. 222 or email us at info@torontoarmenianchurch.com .